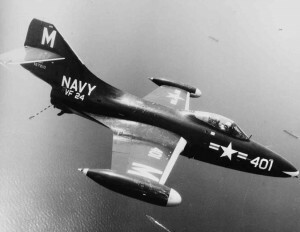 On September 29, 1952, a flight of Grumman F9F Panther fighter jets took off from Quonset Point Naval Air Station for a training flight. The purpose of the flight was to practice carrier landings, or “bounce drills” at the Charlestown Auxiliary Naval Air Station. At one point during the exercise, one aircraft, (Bu. No. 125308), crashed on Quonochontaug Beach in Charlestown. The aircraft was approaching the beach from the west before it suddenly dropped to the sand about one mile east of the ocean end of East Beach Road, and bounced “two or three times”, before cart-wheeling into the water on the Atlantic side. The accident was witnessed by a man operating a bulldozer nearby who was in the process of pushing up sand dunes along the beach. The man ran to the scene of the crash, but when he got there the unidentified navy pilot was wading ashore on his own in no need of rescue. The aircraft was completely wrecked, but the pilot only received minor injuries.